I have just started my MA program in Cultural Anthropology this past week. Things are going well and I am excited for what awaits. In one of my classes, my professor asked all the students to write an “Intellectual autobiography” to share how we came to choosing anthropology, what research we want to focus on and how we hope to use it “professionally”. Here is part of the write up of what I want to focus my research on and what I hope to achieve with it. It is not clear as of now because I am still developing my research focus, I will keep my readers updated when I slowly figure things out. I decided to go back to school because I wanted to be more capable and knowledgeable in understanding and amplifying the voices of Tibetans, both inside and outside. There are many books available on Tibet but most ignore the political aspect and aspirations of Tibetans. 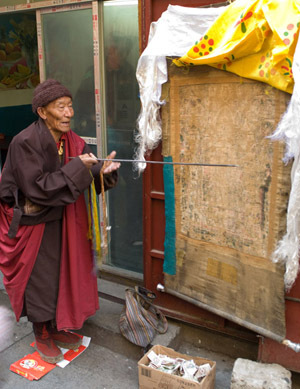 Within the realm of modern Tibetan literature (with the inclusion of the politics) in the academia, there are only few Tibetans who have been capable of doing justice to contemporary Tibet while influencing the current knowledge and discourse available on Tibet, and more importantly, with the approval of the Tibetan community. Faced with that frustration and the on-going problematic usage of colonizing language used by non-Tibetan, Tibet scholars, I decided to try my hand in facing these challenges through ethnography to provide an alternative narrative to members of my community in the hope to empower the existing political struggle of Tibet. I plan to do an ethnographic research on the contemporary Tibetan political movement from the 1990’s to present with a focus of either inside or outside Tibet. It still needs to be narrowed down and as of now, I don’t know where this is going but that’s what I’ll be focusing on. My advisor is Carole McGranahan (Author of Arrested Histories: Tibet, the CIA, and Memories of a Forgotten War, Review by Tsering Shakya & Amy Holmes-Tagchungdarpa) and I’m pretty happy about that. Professionally I hope to be in a position to help in shaping the language from passive to assertive within the on going Tibetan political movement, while continuing my on-going involvement with the Tibetan political groups in receiving and giving training in non-violent resistance strategic theories, actions and technologies. With my research focus on Tibet, luckily for me, everyday will be Lhakar. I will try my best to examine and share the existing knowledge’s while trying/hoping to offer alternative ones and/with critical views. With this, I hope to encourage and empower the youth and our community at large. As usual, please feel free to be “constructively” critical and challenging, albeit with respect. Don’t hesitate to offer any extra knowledge’s or corrections that you see fit. I am always open and look forward to such comments. I will most likely not get all of the picture and I hope my readers will be helpful in offering their own knowledge’s that could help me with my research. wonderful post! looking forward to the next one’s!! i wish you strength and joy for your research! Loved the post. Keep it up D! and for us non-tibetans who keep on learning, it’s very useful to read postings like yours, and even more useful to find more resources to read from which we can learn so we try to do our job the best way possible as trainers, coordinators and activists. For now, I will look for the book you mentioned by Carol M.
How beautiful to find treasures like the picture of the story teller, we don’t find those very often but we need them. Thank you and all the success with school! the study of human being with a context of past, present,future, biologically, culturally and a being of society avobe all holisticallt study of human being is called anthropology. This is so amazing. I am so happy that you have found your vision and mode by which you will make an invaluable and continued contribution! Interestingly, based on what you have written here, I am headed in the same direction. So it makes me even more happy that I have someone to look up to. You are inspiring, please keep up your work! Thanks Chemi. Your research sounds amazing. Let LD know if you’d like to share parts of it to share w/ our readers. I would love to read your journey.